The Gemini 4:4:4 leads the industry as the smallest, lightest weight, lowest power uncompressed / ARRIRAW recorder. 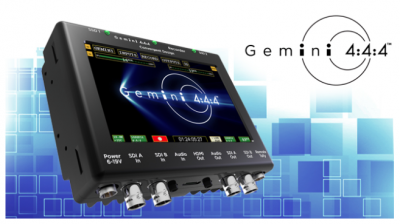 Unlike competitive products, Gemini 4:4:4 includes a built-in 5.0″ LCD monitor, full raster (1920×1080) debayered ARRIRAW output, full support for ARRIRAW at 60fps without expensive hardware upgrades or the purchase of faster drive media. The Gemini 4:4:4 production kit includes an SSD transfer station and the ARRIRAW Option includes a DC-to-DC Converter for surge protection and powering the Gemini from the ALEXA, all for less than 25% the cost of competitive solutions!